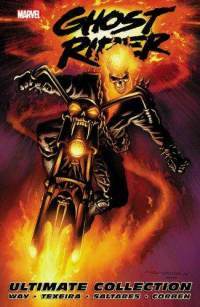 Ghost Rider Ultimate Collection – I’ve hardly read Ghost Rider at all since the mid-seventies when the first series was in full swing (I had a friend who was an obsessive fan and collected the entire series). This one is pretty good, although it starts off fairly slowly. That is, it starts with a bang, but also in a way that’s quite hard to follow – Ghost Rider is in Hell, he escapes with Satan, who showers the earth with 666 shards of his character, which possess that many followers (Satan is, of course, the typical cloven-hoofed beast that has jumped right out of the Ridley Scott film Legend). There are also two silly encounters with other beings from the Marvel Universe, Doctor Strange and The Incredible Hulk (what is it about hero vs hero comics that makes them soooooo lame? ), but then things pick up nicely when we see that Ghostie is getting good at out-thinking the ghouls, and he whittles them down to one. There’s a useless appearance of two angels, who bring themselves into this world via immaculate conception. Some of the stories are very good, including the one drawn by Richard Corben that has Johnny Blaze in jail with a creepy kid who’s actually a senior figure in the Hell’s Angels (get it), and another tale recreated the legend of Sleepy Hollow with another headless horseman, this time a guy who replaces his own head with a flaming pumpkin (yes, so there are two flame-heads now). Ghost Rider destroys all of the bad guys, learns a little bit about his nature, and then rushes off to battle another rebel angel. This entry was posted on Sunday, February 24th, 2013 at 3:42 pm	and is filed under Uncategorized. You can follow any responses to this entry through the RSS 2.0 feed. Both comments and pings are currently closed.